from the traditions of the Tabriz School of Miniature Art. Part of this change in both style and form was due to the fact that some Azerbaijani artists were studying European art. Bahruz Kangarli (1892-1922) and Azim Azimzade (1880-1943), for example, used techniques specific to European and Russian art. Bahruz Kangarli was born in 1892. Though his name means "good day," his life and his name contradicted each other. Bahruz lived a short, difficult life and died at the young age of 30. When he was only five or six years old, his mother died. At 10, he became deaf as a result of an illness, which meant that he had to stop going to school. Later, his father encouraged him to study at home. In spite of all these troubles, Bahruz developed a strong interest in drawing. Bahruz wanted to study art, so he asked his father to send him to Tbilisi where the only art school in Caucasus existed at that time. In 1910, he successfully passed the entrance exam and became the first Azerbaijani student to attend that school. His art teacher was a well-known landscape painter, Vasiliy Polenov. Bahruz became greatly influenced by "Molla Nasraddin" (the first Moslem satiric magazine, published in Tbilisi). After studying five years there, Bahruz returned to Nakhchivan in 1915. Bahruz Kangarli. One of the earliest known paintings of refugees in Azerbaijan, around 1918. There he began a career as an artist. He spent his time creating works of art that glorified views of the city. He also painted portraits of his contemporaries. As there was no Art Exhibition Hall there, he had no place to show his work. So, he began organizing exhibitions in his home. He loved to explain his works to visitors. He also organized a painting circle for children to encourage their interest in art. 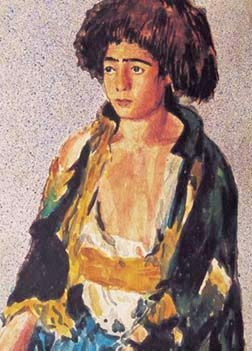 Even though Bahruz' life was very short, he was, by far, Azerbaijan's most prolific artist. Over the course of seven years of creative activity, he created close to 2,000 works of art. Bahruz tried to paint everything as he saw it in real life. Most of his works are landscape paintings. Previously, landscapes had only been used as background material for other subjects. With Bahruz, landscape paintings became a new genre in Azerbaijani art. It seems there was no mountain, plain, architectural monument, lake or river in Nakhchivan or its environs that Bahruz did not paint. Every day, early in the morning, he would take his bag of paints and leave the house. In the evening he would return home, carrying several landscape paintings. He liked to paint on small canvases or pieces of paper. This small size gave him the chance to show his impressions of nature in detail within a short amount of time. "Autumn," "The Way Leading to the Village," "A Flock of Sheep," "Trees," "Old Monument" and "The View of Nakhchivan" are examples of these works. Bahruz also enriched the genre of portraiture. He painted children of all ages in watercolor (usually when they were sleeping). He also painted a "refugees" cycle, depicting the Azerbaijanis who had fled from Armenia and found refuge in Nakhchivan during 1918-1920. Titles of such works include "Barefoot Refugee," "The Refugee Boy from the Janfada Village of Yerevan," "Refugee Khanim" and "Refugees". People say that when Bahruz would meet a refugee in the street, especially if it were a child, he would take him home and feed him, despite the fact that he was living under hard conditions himself. Then he would paint the refugee's portrait. In 1921, Bahruz held his only official exhibition. It was organized in Nakhchivan by the government and included 500 works. By that time, Bahruz was already very ill. On his deathbed, he decided that the money from the exhibition should be given to orphans in memory of his own situation when his mother had died. Bahruz died in 1922; he was only 30 years old. One of Bahruz' best works is currently on exhibition at the Moscow State History Museum. Entitled "Nakhchivan Herald", it depicts an Azerbaijani man on a horse with a gun in his hand, with mountains in the background. The remainder of his works are kept at the Azerbaijan State Art Museum in Baku and the Historical-Ethnographic Museum in Nakhchivan.